Markings display "LSI LOGIG" rather than "LSI LOGIC." "Sample parts of the LSI53C1000R that we have on hand in the quality archives show the part marking to only include the word 'LSI' - not 'LSI LOGIC'... There is nothing on file for a correction of the markings from LSI LOGIG to LSI LOGIC." Further examination from Retronix's testing department revealed that the components had chipped edges, fibre contamination and scratches under the solder spheres - all tell-tale signs of counterfeiting. Retronix's testing department discovered fibre contamination in the components. To confirm their suspicions about the authenticity of the parts, our testing department carried out XRF tests. The XRF analysis results showed that all of the components tested had a Pb (lead) content of over 24%, meaning that they were leaded and not RoHS compliant. The results of the visual inspections and XRF analysis, along with LSI's statement, led Retronix's testing department to the conclusion that the parts should be regarded as "suspect counterfeit." Visual inspections revealed that two of the Hynix components tested had different textures - one had a smooth surface and reflected light while the other was bumpy and dull in its appearance. Following this discovery, the testing team at Retronix subjected the components to permanency marking tests. Using a mixture consisting of one part IPA and three parts mineral spirits, a wipe test was performed. This resulted in a slight fading of the markings. Markings changed from "Hyundai" to "Hynix." Wipe testing using acetone uncovered another issue with the components - the date codes had been altered. The acetone wipe test also proved that the components had been re-marked. Changing date codes and branding is another trick used by counterfeiters to mask the origins of inauthentic parts. Hynix were formerly Hyundai, however these may have been rebranded by counterfeiters in an attempt to pass them off as authentic. 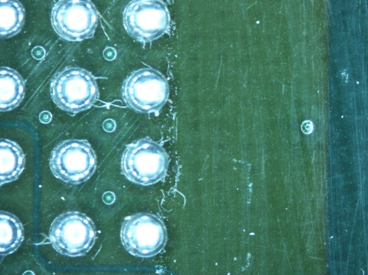 Due to the differences in surface appearance between components and the altering of the date codes and branding, Retronix's testing team has classed these as "suspect counterfeit." Upon initial inspection, there are no obvious attempts at re-marking or re-packaging. However, Retronix's testing team notes that the markings on the die are Intel, not Micron. After further investigation through de-cap testing, it is discovered that while the device is marked as a Micron 8GB device, the die is marked as an Intel 16GB device. Furthermore, the date code on the device is 2009, week 16, while the date code on the die is 2008. The true origins of the device are revealed through de-cap testing. Retronix's testing department then used a programming software which is compatible with the MT29F08G08AAWP device to determine its unique ID code. This is a simple test which any genuine component would easily pass. The results proved that the device code was not authentic. "The Micron part number is for an obsolete product and the die inside the package is for a different part." Although this component did not display any external signs of tampering, the de-cap testing and incorrect ID code - along with Micron's statement - have allowed Retronix to confirm that this component is most definitely a counterfeit device. Worried about the authenticity of your components? Retronix can help.